In 1888, after the Giants had finished first in the National League, and had won a playoff series known today as a "World Series". They played the St. Louis Browns of the American Association for the "Dauvray Cup", which was named after Ward's wife. Ward and a group of All Stars then headed off on a barnstorming world tour. The owners held their winter meetings, and created a classification system that would determine a player's salary. Under the system the most a player could earn was $2,500. The Giants then sold Ward to the Washington Nationals for a record price of $12,000. Ward was furious and left the tour early. He then demanded a meeting with the owners, and said he would refuse to play for Washington unless he received a large portion of his record sale price. Washington would eventually refuse payment on the transaction, nullifying the deal. 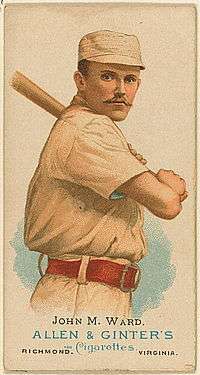 Amidst Ward's commitments as a ballplayer and union organizer he still found time for a third occupation, that of author. His 1888 book, Base-Ball: How to Become a Player, with the Origin, History and Explanation of the Game was the first published effort to explore baseball's development from its early roots. Ward died in Augusta, Georgia, the day following his 65th birthday on March 4, 1925 after a bout of pneumonia, and is interred in Greenfield Cemetery in Uniondale, Long Island, New York. He was elected to the Baseball Hall of Fame by the Veterans Committee in 1964. 1 2 "John Montgomery Ward's managerial statistics". baseball-reference.com. Retrieved 2007-11-17. 1 2 3 4 5 "John Montgomery Ward's career statistics". baseball-reference.com. Retrieved 2007-11-17. 1 2 3 4 5 6 7 8 9 10 11 12 13 14 "Simply Baseball Notebook: Legends". z.lee28.tripod.com. Archived from the original on May 6, 2006. Retrieved 2007-11-17. ↑ http://www.ancestry.com 1860, 1870 US Federal Census Bellefonte, Centre, Pennsylvania 1860 Child Montgomery born Mar 1960. ↑ "1879 Providence Grays team page". baseball-reference.com. Retrieved 2007-11-17. ↑ "Perfect games by pitchers:Box scores". baseball-almanac.com. Retrieved 2007-11-17. 1 2 "Who Was Baseball's Most Interesting Character? Monte Ward, by Mike Attiyeh". baseballlibrary.com. Retrieved 2007-11-17. ↑ "1888 New York Giants team page". baseball-reference.com. Retrieved 2007-11-17. ↑ "1889 New York Giants team page". baseball-reference.com. Retrieved 2007-11-17. ↑ "John Montgomery Ward's Obituary". New York Time, Thursday, March 5, 1925. Archived from the original on 2007-09-29. Retrieved 2007-11-17. ↑ "John Montgomery Ward's Hall of Fame profile". baseballhalloffame.org. Archived from the original on 2007-06-08. Retrieved 2007-11-17. ↑ "John Montgomery Ward's career statistics". retrosheet.org. Retrieved 2007-11-17.